For brands, it’s no longer whether or not you’re marketing online. It’s now a discussion about how you can earn someone’s attention and convince them to share your content. A great way to amplify your content is through a highly targeted influencer marketing strategy. 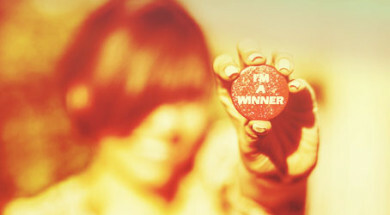 Influencers work hard to cultivate relationships and maintain their position as a leader within their niche. Partnering with influencers in your industry helps get your message in front of the right audience and accelerates conversions. However, an influencer strategy is not without its challenges. A whopping 75% of marketers consider finding the right influencers the most challenging aspect of this outreach strategy. If you’re one of the many who find it difficult to identify an influencer, though, have no fear: A ton of marketing leaders shares their expertise, and they serve as an excellent resource as well as an example of what works. 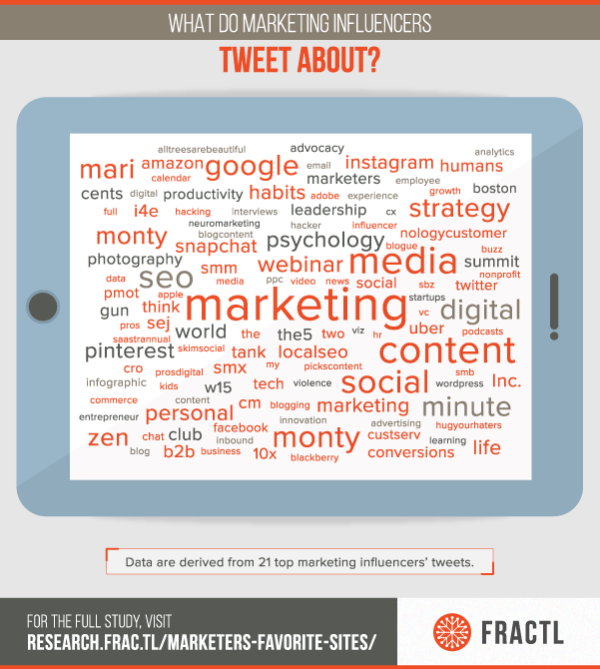 My team recently took a closer look at 21 marketing influencers based on a combination of follower count, regular Twitter usage, and a percentage of marketing-focused tweets. We analyzed the last 100 links each of these marketers shared over two days (excluding links to their own sites) to get a better understanding of what they’re talking about and what sites they’re visiting to uncover key insights. My first piece of advice is simple. Nearly a third of the influencers posted a tweet directly related to influencer outreach in our two-day evaluation. How did we find them? BuzzSumo: With a tab devoted exclusively to “influencers,” searchers can use keywords and discover the Twitter handles of accounts sharing similar keyword-related content. Filters allow users to sort influencers by reach, authority, influence, and engagement. An added bonus? When you’re done researching, you can easily export all the results for use in other platforms. Moz’s Followerwonk: A tab devoted exclusively to influencers – “Search Bios” – provides users with social authority, comparisons, and even unique data visualizations for keywords and Twitter handles. It also includes a feature to save reports for future use. Individual social networks – Using social networks such as Facebook, Twitter, and LinkedIn is a great way to find influencers through simple keyword searches while simultaneously letting you vet a potential influencer based on his or her connections and level of engagement. Keep in mind you’ll also want to look at the type of conversations they’re having, specifically if and how they talk about your industry and outreach. Regardless of what tool you use, though, the key is to find individuals who have an established voice and social presence. By following them, you can ensure that you’re connected to stay on top of the latest trends to help your brand maximize every influencer relationship. The concept of reciprocity is simple: If someone does something for you, you naturally want to do something for them, and our study indicates that marketing influencers understand that value based on the sheer volume of content they’re sharing directly from their colleagues. When we looked at the top three shared sites of each influencer, nearly 50% included other influencers’ sites or personal blogs. Exchange an email unrelated to any content you’re promoting. For example, if you saw that their blog was nominated for an award, send a brief congratulations email. Thank the influencer in a tweet for any help they offered you that week. Offer to collaborate on projects so that they have more ownership of the content you want them to promote. Although every influencer is different, when developing these relationships, remember to be as authentic and personable as possible. Respect and genuine interest are what will make these valuable partnerships last. Brands frequently fall into a trap of believing that the number of followers is the most important metric to consider when identifying influencers. New analysis reveals that you only need a handful of influencers – anything from a publisher like CMI to an individual like Joe Pulizzi – to give the impression that everyone is talking about your brand. This social phenomenon is known as majority illusion, and the marketing influencers we looked at seem to understand this networking trick as well: industry-specific sites like Content Marketing Institute, Moz, and Convince & Convert earned spots on the 10 most-shared list alongside bigger publishers like Inc., Entrepreneur, and Forbes. Relevance: Figure out whether the content already shared by the influencer connects with your brand. If the connection is a stretch, move elsewhere. Engagement – Take a look at some of the influencer’s top posts (i.e., those which earned high social shares) to get an idea of their overall engagement. The goal is to determine whether the influencer interacts with the audience (if yes, your chance of conversions from this influencer improves). Quality – Get a feel for how often they post and what kind of content they’re promoting. Are they spammy and posting just to post? A good indicator of quality is how an influencer’s site ranks in search. A high ranking for particular keywords indicates that their blog has been deemed influential in that category by Google. Remember that each step is bringing you closer to an influencer’s level of authority. The more trust they have within their industry, the more likely they can push your prospect further along the buyer’s journey. There’s a ton of resources out there to help you outline an effective influencer strategy. Keep in mind that partnering with an influencer provides a range of benefits to your brand – including increased awareness and traffic. Whatever your end goal is, though, remember that highly focused targeting and quality content are what generate a mutually beneficial relationship that will make your influencer strategy work. What techniques do you use to identify and evaluate influencers? I would love to read your thoughts in the comments. Andrea Lehr is a Brand Relationship Strategist at Fractl where she works alongside a team of creative strategists to produce unique, data-driven campaigns about industry trends. 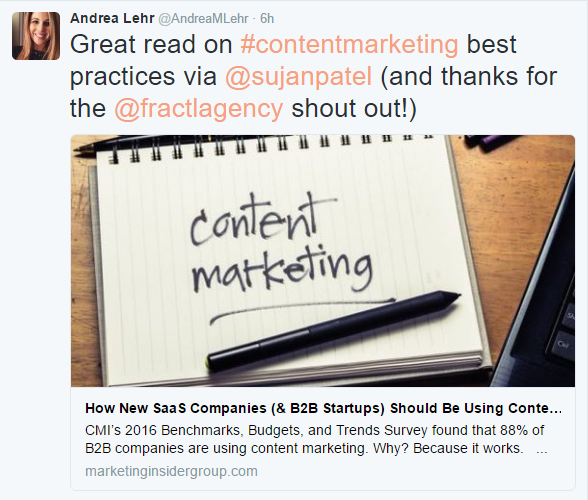 Connect with her on LinkedIn for daily updates on great content; follow her on Twitter @AndreaMLehr for the GIFs.